Join the Library Associates and Dean Harriette Hemmasi for the Annual Tanous Family Endowed Lecture on Monday, April 15 at 5:30 pm in Lohrfink Auditorium, Hariri Building. 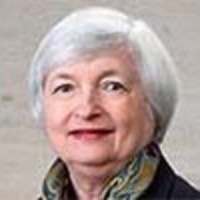 This year's lecture will feature Dr. Janet Yellen, Former Chair of the Board of Governors of the Federal Reserve System, who will discuss the past, present and future of the United States Reserve System. The evening will also include remarks from John J. DeGioia, President, Georgetown University.